P.S. Duffy lives in Rochester, MN. She was born in mainland China to American parents who were part of the Anglican mission there, returning to Massachusetts in 1950. She spent 35 summers sailing in Nova Scotia, where her family roots go back to 1754. She has a degree in history from Concordia University in Montreal and a Ph.D. from the University of Minnesota. Following a 25-year career in neurologically based communication disorders, she now balances writing in the neurosciences for Mayo Clinic with creative writing and is the author of flash fiction, creative non-fiction and a graduate textbook on right brain damage. 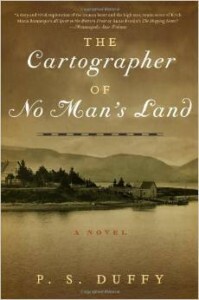 The Cartographer of No Man's Land(W.W. Norton), is her first novel.